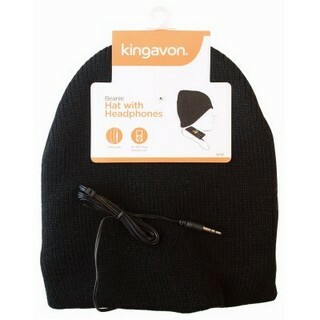 A blue beanie style one size fits all hat from Kingavon with in-built USB rechargeable 4 LED light. An ideal companion after dark for runners, walkers, cyclists or for those on camping or hiking trips.Also ideal for those doing jobs after dark whereby two hands are needed. 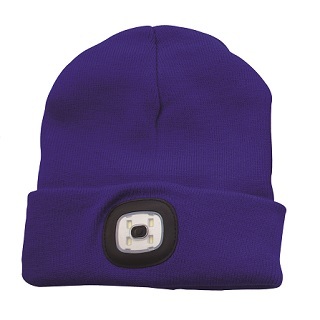 The headlight hat has a simple on/off push button located in the middle of hat with 3 different brightness settings. 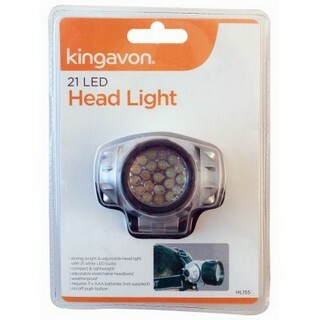 The light will work for a maximum of 5 hours continuous use at 120 lumens and will fully recharge in just 2 hours. The hat can be eitherhand or machine washed when required. Press button to turn on and toggle between 3 light intensity levels. Pull hat rim open and push light inward to remove. Hat can now be washed. Remove light as described and black rubber cover from the USB connection and plug into USB port, the light can then be charged fully within 2 hours. Remove the light as described. Hat can now be cleaned by hand or washing machine.